Timmins Engineering provide a full structural steelwork design & build service, bespoke to suit your structural steel service requirements. Our structural steel services team have worked on various residential, agricultural, industrial, commercial and development projects over the past 35 years, and are very experienced in providing a full structural steelwork design & build service. Timmins structural steel services team provide a full in-house service within the purpose built workshop, carrying out steel connection detailing, fabrication, painting, and then deliver your structural steelwork directly to you. The highly qualified operatives at Timmins are able to provide 3D structural steel design & build within very tight time frames including detailing and fabrication, maintaining the very highest quality service. All of the structural steel is certified to BS EN 1090-2:2009 regulations, and Timmins Engineering were one of the first companies in the UK to become CE accredited for structural steelwork, providing guaranteed quality, in-house 3D structural design. As well as painting and supplying the structural steel beams for new home builds, renovations, building refurbishments or house extensions, Timmins also carry out 3D structural steelwork design & build. As well as fabrication of structural steel beams, posts and lintels. If required, the team can also provide on-site installation and welding of the steel to concrete fixings, and steel posts. 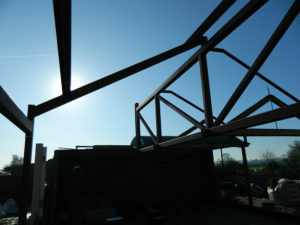 The highly qualified structural steelwork team have worked within the building trade for a number of years. Timmins understand the timescales associated with structural steel house beams, and that builders require delivery within a specific schedule. Fully committed to delivering on time, the team at Timmins ensure the building site experiences minimal downtime due to delays in their schedule. Free on-site advice is also provided if required, advising the builders of the best installation method for the metal support beams. Communication between parties will be regular throughout your project, minimising any chance for errors. Timmins Engineering regularly produce over 50 tonnes of structural steelwork weekly, allowing the facilitation of large industrial and commercial structures. With experience of working closely with structural engineers, architects and builders and providing first class structural steel services, Timmins are committed to delivering the highest quality commercial structural steelwork design & build service. A full service is provided by Timmins from an initial on-site survey to confirm the full project specification, to in-house detailing and painting by expert teams, and of course final delivery. An on-site welding service is also provided, allowing the builders to continue with their more important tasks.